Portrait of Colonel Hans Christan Heg, commander of the 15th Wisconsin Volunteer Infantry in the Civil War. Heg was fatally wounded at the Battle of Chickamauga on 19 September 1863 and died the next day. Original print presented by Trygve M. Ager in 1961. Heg was born on 21 December 1829 in Lier, Norway (near Drammen) and came to Wisconsin in 1840 with his parents, Even Hansen Heg (1790-1850) and Sigrid Olsdatter Kallerud (1799-1842). The family settled at Lake Muskego, now Norway Township, in Racine County. He spent a year panning for gold in California before returning to Wisconsin and marrying Gunild Jacobsdatter Einong on 10 December 1851. He was fluent in English and was an early member of the then new Republican party (started in Ripon, Wisconsin), sharing its firm anti-slavery view. In 1859 he was the first Norwegian elected to a statewide office, Prison Commissioner, earning a reputation as a pragmatic reformer. In 1861 he resigned to accept the Governor's appointment as Colonel in command of the then-forming 15th Wisconsin Infantry. He was 31 years old and his only prior military experience was in the Wisconsin Militia (a forerunner of the state's National Guard). After distinguished service at Stone('s) River, Colonel Heg was assigned to lead the 15th's brigade. 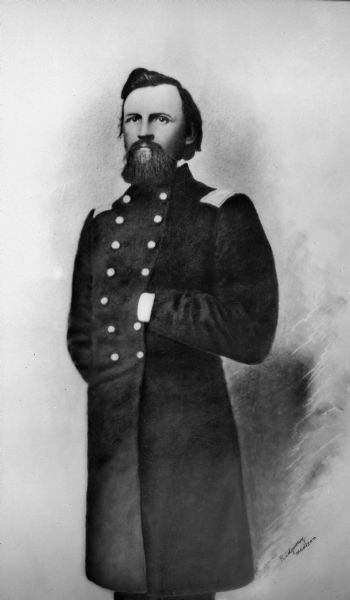 Colonel Heg died on 20 September 1863 of wounds sustained the previous day while leading his brigade at Chickamauga, Georgia. At age 33 he became the highest ranked Wisconsin officer killed in the Civil War. He is buried in Norway Township, Racine County, Wisconsin, and his statue is on the northeast corner of the State Capitol grounds in Madison.